Hearing loss is a common problem that often develops with age or is caused by repeated exposure to loud noises. There are four types of hearing loss. The charity Action on Hearing Loss estimates that there are more than 10 million (about one in six) people in the UK with some degree of hearing impairment or deafness. Hearing loss can occur suddenly, but usually develops gradually. Find out about the types in detail below. This is caused by a blockage in the outer or middle ear, preventing sound waves from reaching the sensory hair cells in the inner ear. Conductive hearing loss has a plugging effect in the ear: sounds from the outside are difficult to hear, but the person’s own voice or chewing can be heard clearly. The blockage may be temporary or permanent, and the degree varies, though it’s usually mild or moderate. Possible causes include ear infections, excessive earwax, a foreign object trapped inside the ear canal, a hole in the eardrum or a problem preventing the three ossicles, the small bones in the middle ear, from vibrating. Medication, surgery, hearing aids , middle ear implants or bone conduction implants, depending on the cause. Hearing aids, middle ear implants,or cochlear implants, depending on the severity of the hearing loss. Cochlear implants are appropriate for severe or profound sensorineural hearing loss. This is a combination of sensorineural and conductive hearing loss. Medication, surgery, hearing aids, MED-EL , or bone conduction implants, depending on the root cause of the condition. 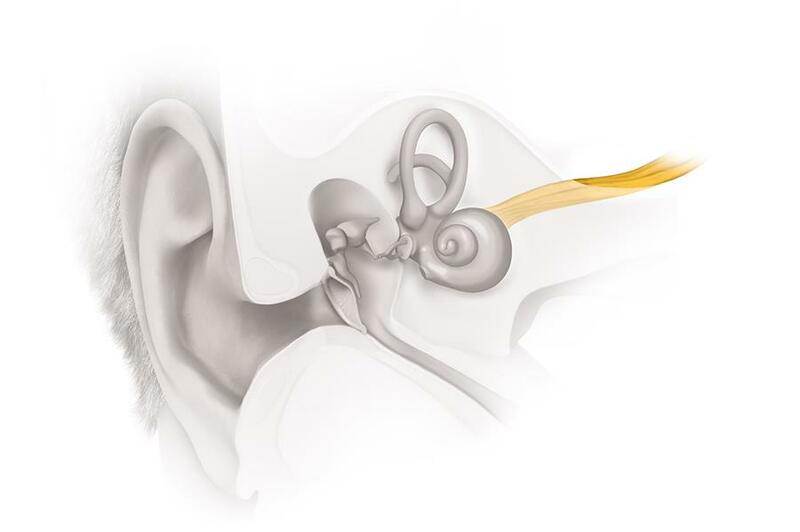 This rare type of hearing loss is usually profound and permanent, and caused by an absent or damaged auditory nerve. Unfortunately hearing aids and cochlear implants cannot help because the nerve is not able to pass on sound information to the brain.